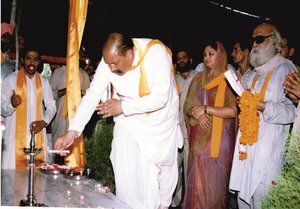 Shri Satpal Ji Maharaj, the son of Paramsant Satgurudev Shri Hans Ji Maharaj,was born on 21st September 1951 at Kankhal in the holy town of Haridwar. His father’s life was one of selfless service to humanity and of tireless devotion to the ideal of awakening man’s dormant spirituality. Birth in the family of an enlightened Yogi, combined with his own inherent tendencies, facilitated Shri Satpal Ji Maharaj’s spiritual development from a very early age. By the age of two and a half he was already sitting for long periods of meditation and he encouraged others to do likewise. His father once remarked that his consciousness was naturally drawn inwards but was to be drawn out for the benefit of others. 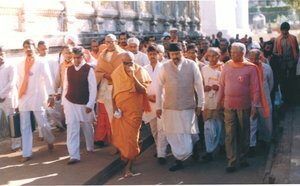 Growing up in a spiritual environment, under the strict guidance of his parents and surrounded by mahatmas and devotees, he very soon became a master of the spiritual science. 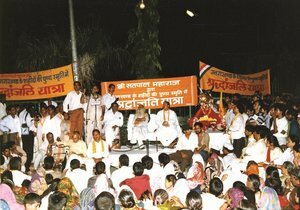 Shri Satpal Ji Maharaj is well-known as a social reformer. He has always been a man of the people. 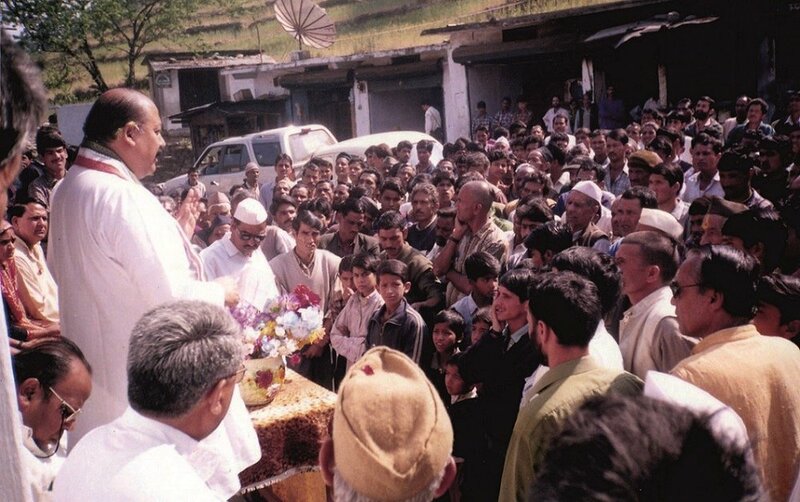 During his extensive tours in the northwestern Himalayan region of Garhwal, Maharaj Ji came to know about the endemic problems of the area and has been actively advocating various social welfare programs to promote literacy, employment and a fair deal for women ever since. He knows that social and economic problems are all interrelated and none can be tackled in isolation. He has an excellent ability to interact with people from all walks of life and is also very decisive when it comes to presenting critical issues to be addressed on both social and political platforms. His task, as he sees it, is to “restore respect for the past, find solutions in the present and devise a proper course of action for the future.” He is trying hard to unite all sections of society under the banner ‘One Nation, One Flag, One Spirit’. He urges people not to rely on the Government to solve their problems but to break through their mental barriers and caste prejudices to uproot communal malice, in order to work together for the sake of society as a whole. 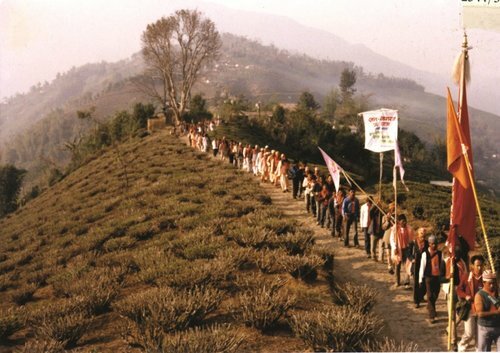 Years of tireless effort and extensive touring of India, Nepal, and Bhutan led to a series of padyatras (a long march with a spiritual and/or social purpose). 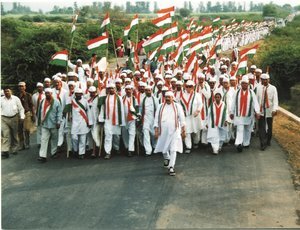 The first Padyatra, the ‘Bharat Jago Padyatra’ (‘India Awake!’) began on September 24, 1983, from Badrinath, (elevation 10,000 ft) in the Himalayas. The 710-km route, covered entirely on foot, included historical places such as Pandukeshwar, Joshimath, Karnaprayag, Rudraprayag, Devprayag, Rishikesh and Hardwar. In addition, he visited 500 villages and met more than 300,000 people along the way, talking to them and listening to their grievances. The poor and needy were given blankets and medicines. 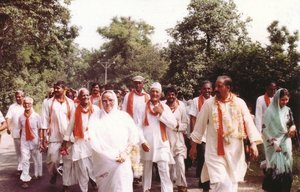 The second Padyatra, ‘Jan Jagran Padyatra‘ (‘People Awake!’) began on 11th March, 1985, from Gandhi Maidan, Siliguri (West Bengal). It passed through the mountainous areas of Darjeeling and ended at Gangtok, the capital of Sikkim. 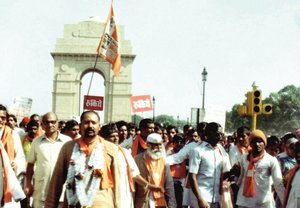 This 250-km Padyatra led to renewed spiritual and social awareness among the backward but pious local population. It also called upon the Government to recognize and alleviate the various problems endemic to these areas, and to heed the pleas of the local people, who felt grossly neglected by the authorities. It also supported and re-energized the long-pending demand for recognition of the Nepali language. 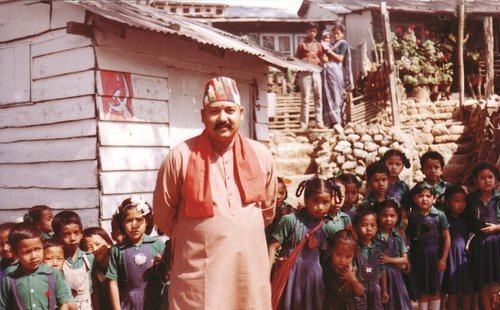 This demand was successful and Nepali was recognized in the 8th Schedule of the Constitution of India. 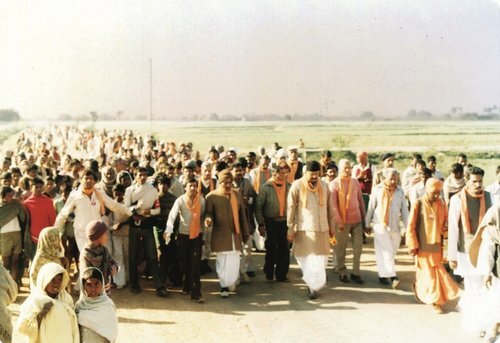 JanAta Jage Padyatra: Year – 1986, Distance – 230 kms From – Bodh Gaya to Patna in Bihar. Aim: To promote caste and communal harmony and to desist the youths from resorting to violence and crime. 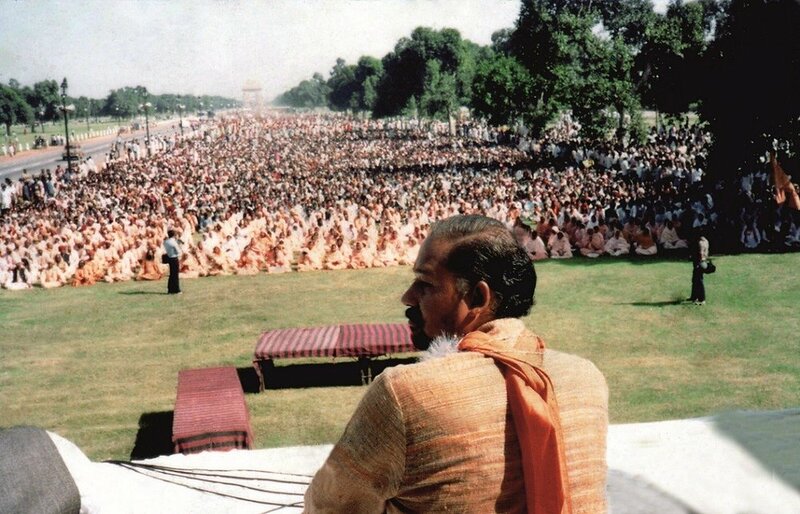 As he crossed this volatile State, his message to the public and especially young people was, ” You all are temples of the Divine Energy. You are His mosques, churches, Gurudwaras and Ghompas. Awaken and realize the power within yourselves, smash down the walls of hatred and enmity, and spread the message of love, peace and unity.” He explained that a law-abiding atmosphere is essential for sowing the seeds of economic and social progress. Religious intolerance fuels communal mistrust and misunderstandings, social prejudices and carnage. 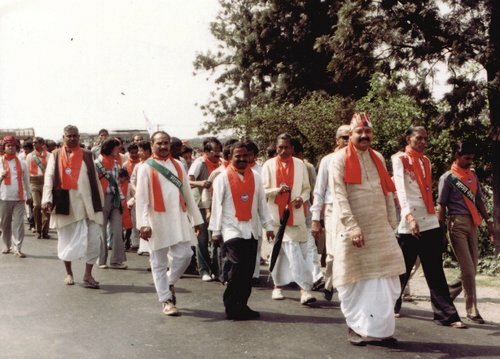 Shradhanjali Padyatra: Year – 1995, Distance – 350 kms, From – Gopeshwar to Rampur Tiraha, Near Muzaffarnagar in U P. Aim: for Paying tribute to the martyrs of Uttarakhand movement. By 1995, the Himalayan region warranted restructuring. The administrative framework based in Lucknow, Uttar Pradesh was ill-equipped to address the endemic and unique issues of the mountain areas. The terrain and culture of Garhwal and Kumaon posed their own problems. As a result, these regions were not getting the attention they deserved. 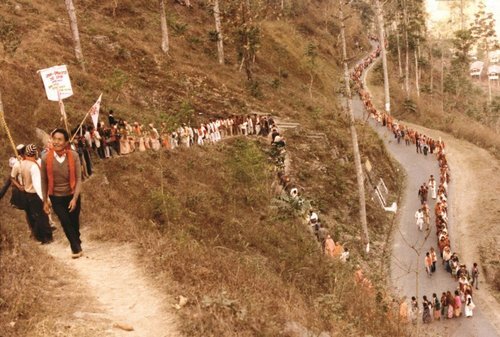 Maharaj Ji supported their cause from the very beginning and actively participated in the ‘Uttarakhand Movement’ – the demand for a separate state. He was appalled by the violence inflicted by the UP police on peaceful demonstrators which caused death and injury. 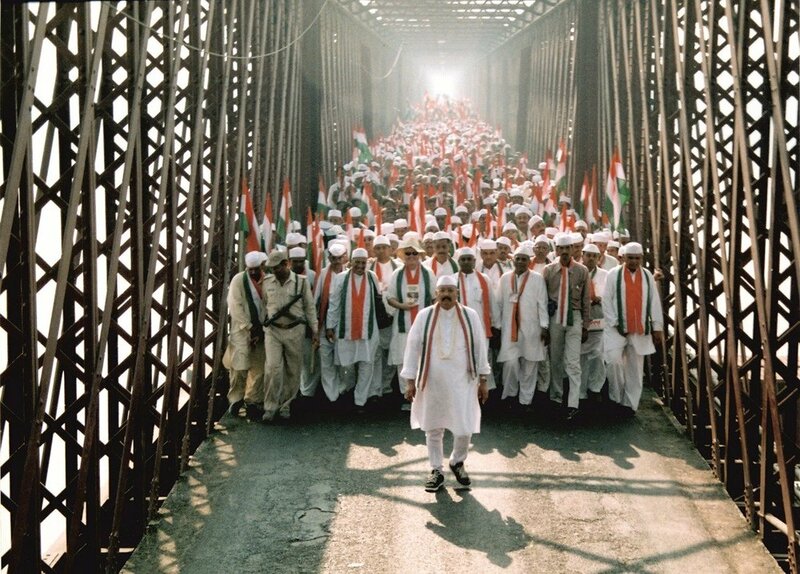 In 1995 he undertook the Shraddhanjali Yatra, which started from Gopeshwar in the Uttarakhand Himalayas and ended at Muzaffarnagar in UP. The aim of this yatra was to pay homage to the martyrs of this noble cause. Subsequently a beautiful memorial, the Shahid Smarak, was built in their honour at Narsain, which now stands as the Gateway to Uttarakhand. 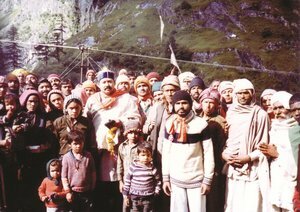 Maharaj Ji knew that the real tribute to the martyrs would be achieving statehood for Uttarakhand. He found the opportunity he was looking for during the government of Shri HD Devegowda. 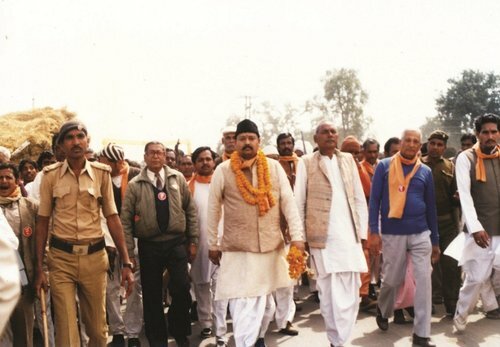 As Minister of State for Railways, Maharaj Ji convinced the Prime Minister of the need to grant full statehood to Uttarakhand, rather than piecemeal gestures such as a Hill Council. At last, on August 15, 1996, , during his Independence Day Address, the Prime Minister announced statehood status for Uttarakhand. 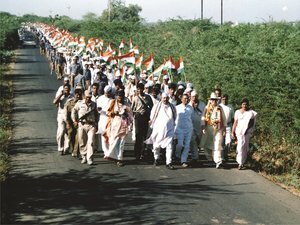 SADBHAVANA PADYATRA: To spread the message of peace, brotherhood and unity in the society, this Yatra was organised from Dandi to Sabarmati Ashram, Ahmedabad (Gujarat) covering a distance of 350 Kms. 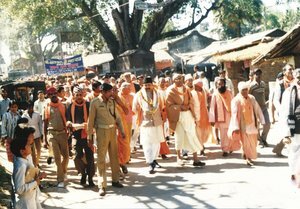 In November 2002, Shri Satpal Ji Maharaj undertook the Sadbhawna Padyatra (March for Peace and Goodwill) through the state of Gujarat, which had been torn apart by horrific religious riots. He believed that Mahatma Gandhi’s home state should stand out as a beacon of economic progress and human development, but this was being held back by communal hatred and divisive politics.